You’ve got your inventory done, right? I really hope you took the time to do that. Now it’s time to put up your decorations. I’m not going to tell you where to put them, though. Unless you want to pay me. Then I’ll tell you exactly where to put your decorations! 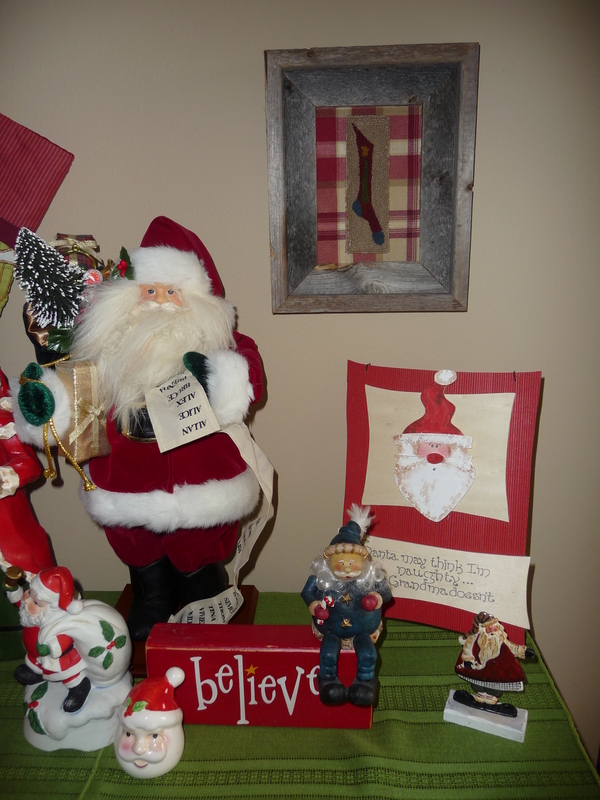 Turn on some Christmas music, make yourself some hot cocoa and get decorating! When you’ve got everything up and just the way you want it, get your camera out. Remember when I mentioned (a couple of posts ago) about taking pictures of your Christmas decorations? Now’s the time to do that. Unless you have less than 5 decorations. You should be able to remember that many. If not, make an appointment with your doctor today. The pictures serve a grand and glorious purpose! If you’re like me and pretty much put your decorations in the same place every year then you’ll love this tip. Actually, even if you like to experiment with different things every year, the pictures can serve as a reminder of what you’ve already done and what you liked and didn’t like about your decor. #1. Take pictures of your decorations. Another note: the square you see next to our family picture is a paint sample that we’re thinking of using in our livingroom. I’ll let you know how it goes. #2. After you download them to your computer, copy and paste them into a simple word document. You can organize the pictures by floor and by room if you like. #3. Print the document and store it in your decorations box. #4. Next year when you’re ready to put your decorations up, you’ll already have pictures showing where things go and you won’t have to reinvent the wheel! I’ve been doing this for a couple of years now and I can’t tell you what a difference it’s made. I don’t have to analyze, re-position and re-think where every little thing goes and wonder if it looks good here or if it would look better somewhere else. It makes decorating faster and less stressful because the thinking is already done for me. It used to take me days to put up all my Christmas decorations. Yes, days! Not anymore. 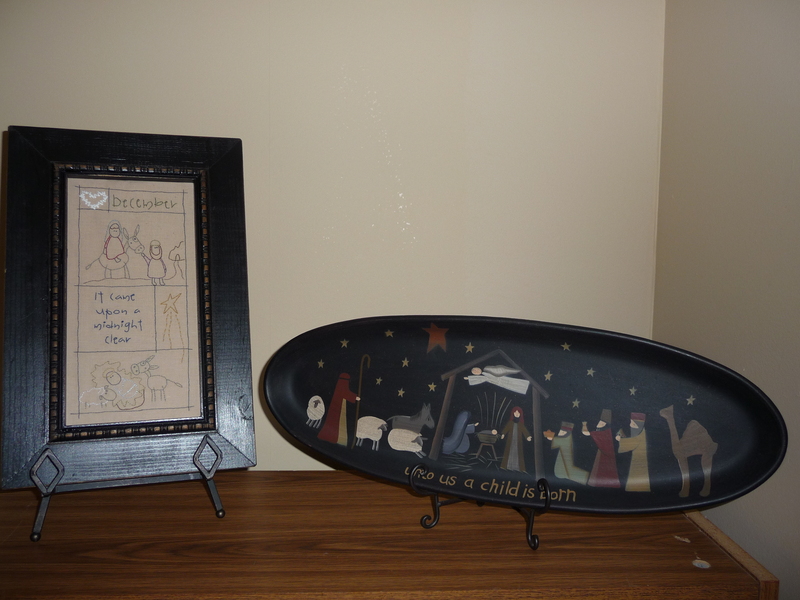 I collect nativities. I have over 30 of them. Can you imagine if I tried to arrange them afresh every year? (don’t you love that I used the word afresh?) That would take forever and I don’t have forever. 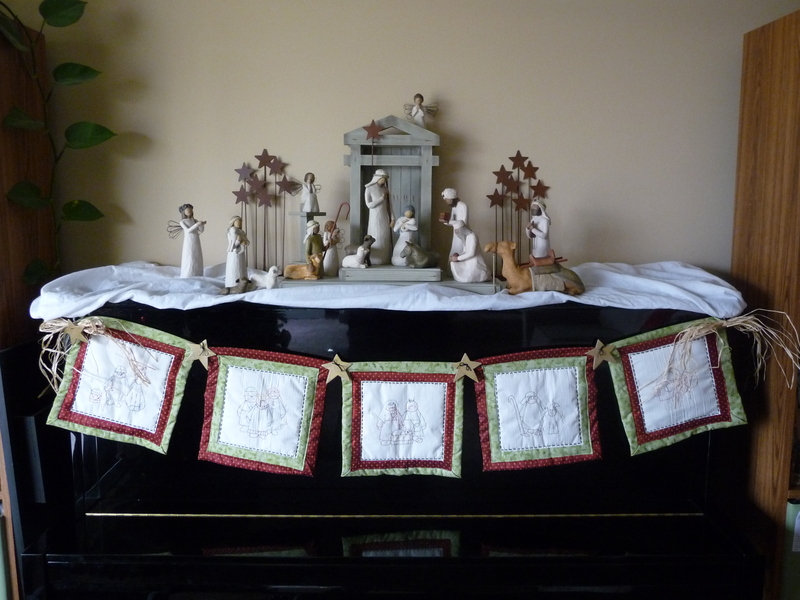 ﻿The framed nativity above is an embroidery that I just recently completed. I love how it looks. The quilt hanging with the wooden stars is also a nativity, although I know you can’t really see it. It was the 1st (and only) quilting I’ve done so far. It’s super cute. Now I must confess that I do tweak things here and there and occasionally move items from place to place. I might get another nativity or add something to my decor. My tastes change and what I used to love I don’t anymore so I get rid of it. But it’s very limited because I genuinely like where I have things right now. That’s why this tip works for me. I dare you to try it. People may think you’re weird (I’ve gotten that from some), but it really will help you for next year. Besides, we know who the weirdo’s really are, don’t we? 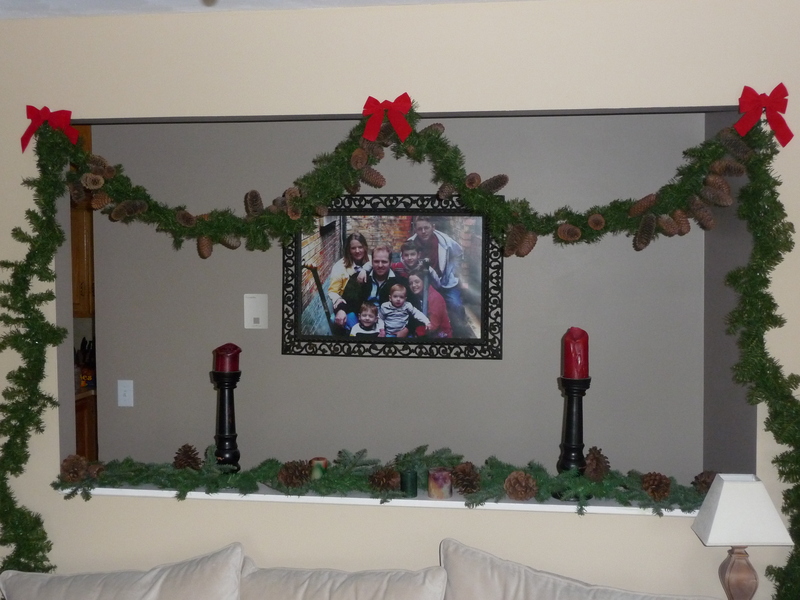 This entry was posted in Holidays, Organizing and tagged decorating, nativity, pictures. Bookmark the permalink. Jenn, your website is awesome! Rebecca just told me about it. I’m looking forward to reading through all the old posts. You should check out my blog for the “other” viewpoint :). Thank you! I hope it helps some. And Happy New Year! Hi Jenn! 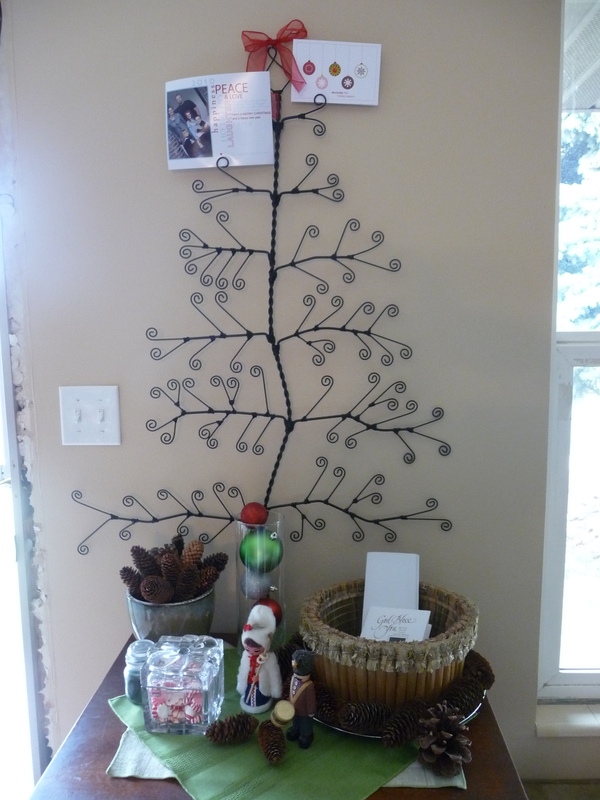 I just took Christmas cards off the fridge finally and reread through yours and decided to stop by your blog. I LOVE your Christmas card holder. Where did you get it? I’m excited to read back through your posts. Anyway, hope you’re doing well! Thanks, Heidi! I got the Christmas card holder at Pottery Barn. Years ago my best friend gave me a gift certificate there. I had been eyeing the card holder for a long time already & decided to use the gift certificate for that. And I love it, too. It’s cute, classy & whimsical. Thanks for checking out my blog!